Q1. How to use pstree command? Q2. How to make pstree include command line arguments in output as well? Q3. How to force pstree to expand identical subtrees in output? Q4. How to make pstree highlight a specific process? Q5. How make pstree show process group IDs in output? Q6. How to make pstree sort processes based on PIDs? Q7. How to make pstree display process tree specific to a user? Q8. How to restrict Pstree to a specific process? 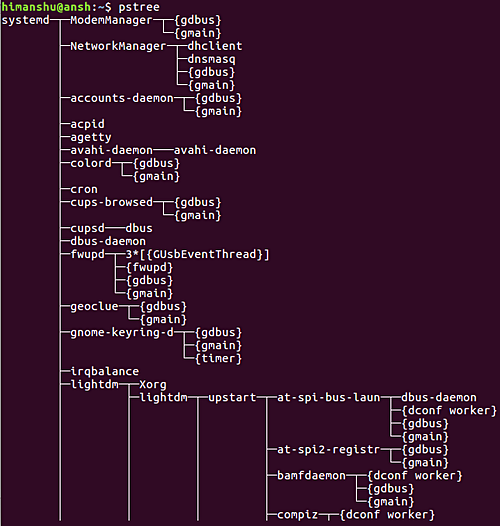 Since every process (except the very first one) in a Linux system has a parent, it sometimes makes things easier to understand if all processes are displayed in a tree structure. 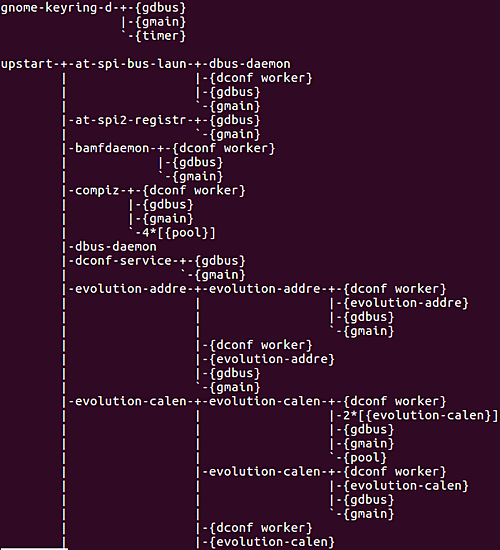 You'll be glad to know there exists a command line utility - dubbed pstree - that displays a tree of processes. In this tutorial, we will discuss the basics of pstree command using some easy to understand examples. 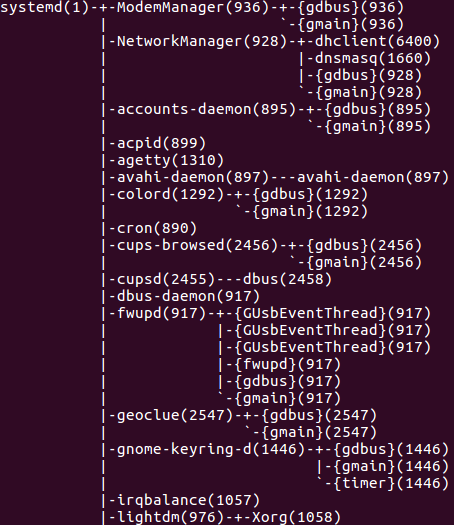 But before we do that, it's worth mentioning that all examples here have been tested on an Ubuntu 16.04 LTS machine. end of the line to press return and will not return until that has hap? pened. This is useful for when pstree is run in a xterminal. Basic usage is simple: all you have to do is to execute 'pstree' sans any option. So you can see this is how pstree produces process-related information in output. This can be done using the -a command line option. 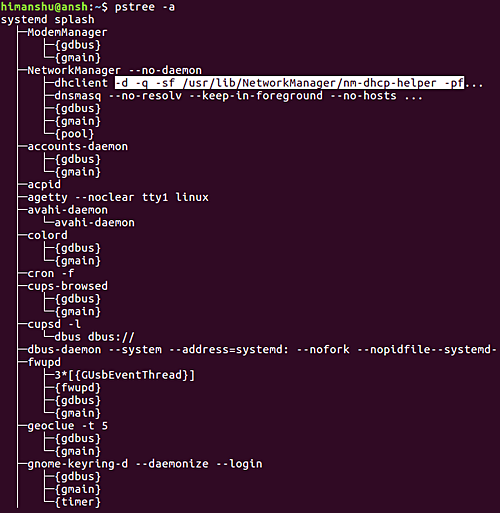 So you can see the pstree command now also displays command line options for some processes. However, if you want, you can force the tool to expand identical trees, something you can do using the -c command line option. In case you want the tool to highlight a specific process in output, use the -H command line option. 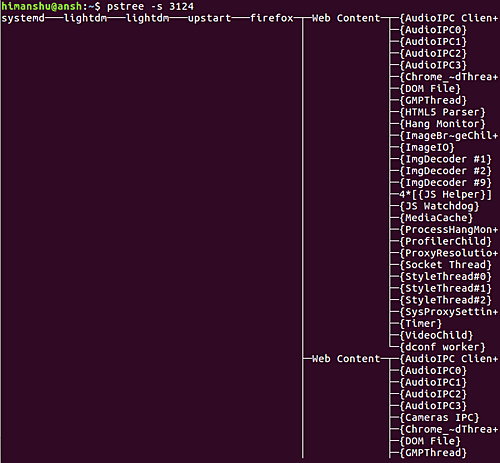 So you can see the name 'firefox' is slightly highlighted compared to other names. For this, use the -g command line option. So you can see that process group IDs are shown as decimal numbers in parentheses after each process name. By default, pstree sorts processes with same ancestor by name. However, if you want, you can have pstree sort processes by PIDs as well, something which you can do using the -n command line option. Note that this type of sorting is also known as numeric sort. If you want pstree to display all process trees rooted at processes owned by a specific user, then all you have to do is to pass the name of that user as input to the command. If you want pstree to display only the parent and child info for a specific process, use the -s option. Depending on the kind of work you do, the pstree command can be of great help. Here, in this tutorial, we have discussed some key command line options this tool offers. For more info, head to its man page. hi, I still miss a way to see the bash loop content. But I guess due to the interpreter style of the bash this isnt possible at all. Dont it ?